Union has one purpose for being: to build the best snowboard bindings on the planet. They consider their objective complete each time they crank out another pair of high performance binding that not even the pros can wait to get their boots in. By using the best materials and most innovative processes, Union is creating a movement within the industry that is forcing other brands to try and keep up. Their futile attempts make Union giggle. The year 2005 marked Union’s first attempt at making bindings. They were inspired to get into the game because they felt like they could play it better than anyone else. As it turns out, they were absolutely correct. In their very first year of existence they posted a zero warranty/return rate. That is unheard of, but it proved that Union had indeed made a completely bombproof binding that would be considered an elite product. Fast forward to now and Union is still at the top, right where they started. With no plans of relinquishing their foothold, Union never stops challenging themselves to not just push, but blow the limits away. They are 100% committed to research and design, which leads them to develop insanely light, yet ultra functional bindings with more durability than you can shake a shred stick at. Their team of professional riders includes names like Danny Kass, Dustin Craven, and Joe Sexton. Odds are if Union bindings are good enough for them, then they are going to straight up blow your mind. The technology that Union unleashes is astounding. Not only is it the first time anyone in the industry ever comes up with something like it, but it also sets new standards each time. They come up with crazy stuff like injecting their buckles with magnesium to give them four times the toughness of aluminum with as little as half the weight. Carbon fiber has been incorporated in certain models for the ultimate lightweight/strength combo. The list goes on, but you get the idea: strong, light, and lasting. Union includes a lifetime warranty on their bindings, but odds are, you wont need it, which is good because you probably accidently threw out the warranty papers with the box, and that sound you hear is the recycle guy driving away. A perfect example of everything Union is doing to make bindings amazing is the Union Flite Binding. These things feature Grade 8.8 steel hardware, a progressive highback with the perfect amount of flex for tweaking out your tricks, and EVA bushings in the base for great dampening and improved board feel. Just like the rest of the Union lineup, the Flite Bindings are lightweight, rugged and will crush everything they encounter, except your wallet. Union’s dedication to the progression of the sport is obvious to anyone who straps into their equipment. 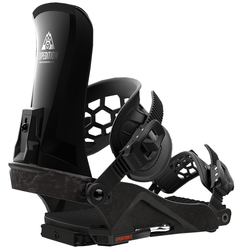 By taking bindings to unprecedented echelons, Union pushes you to take your snowboarding experience to the next level.